Every year in May, Dying Matters and coalition members host a fantastic range of events and activities around the country with the aim of getting people talking about dying, death and bereavement and making plans for their end of life. This year sees the sixth annual Dying Matters Awareness Week, which runs from 18 – 24 May 2015. Nothing can eradicate the inevitable sadness accompanying a loved one’s death, but advance discussion and planning goes some way to providing comfort all round. We want to get as many people as possible thinking, talking and acting during Dying Matters Awareness Week and wish to invite the local community to our FREE event. 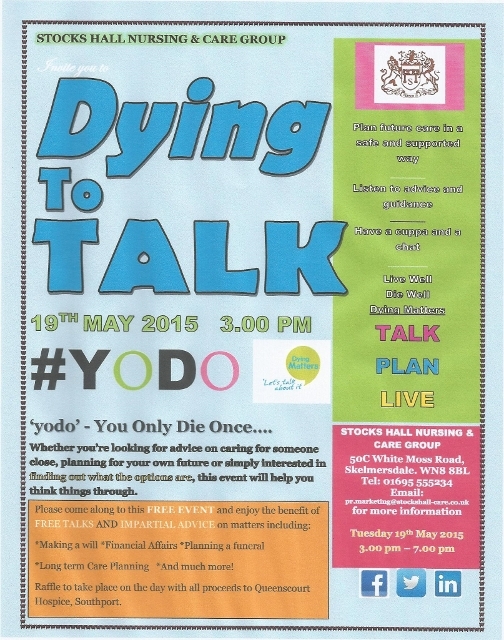 The theme of Dying Matters Awareness Week 2015 is ‘TALK, PLAN, LIVE’, an action-focused phrase emphasising that we only get once chance to have our dying wishes met, which is why it’s vital to talk, plan and make arrangements for the end of life – before it’s too late. To support the week, Stocks Hall Nursing & Care Group will be hosting the awareness raising event at our home in Skelmersdale on Tuesday 19th May 2014 opening at 3.00 pm. It will be an opportunity to talk about planning, making arrangements, having wishes heard and us giving support in whatever way we can. The theme of the event will be centred around Butterflies. We plan on releasing home-grown Butterflies on the day, as a symbol of reflection and a mark of remembrance.